Norman Rockwell was a very popular American illustrator and painter of the 20th century. He was born in New York City on February 3, 1894. What made him famous were his cover illustrations for the magazine, The Saturday Evening Post that showed American culture in everyday scenarios. 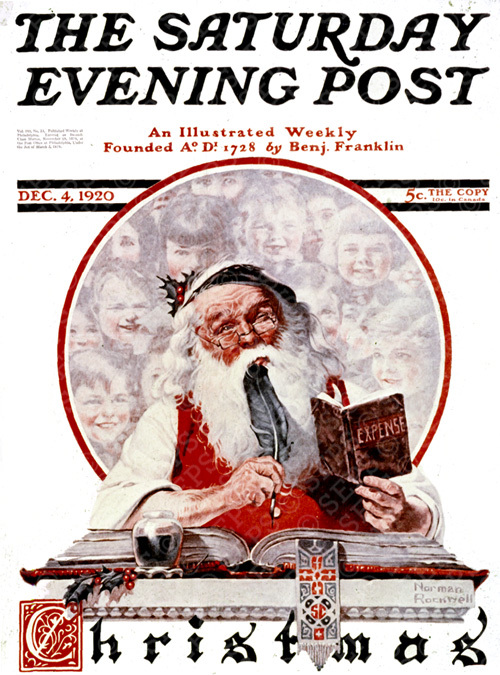 For more than four decades, Rockwell provided the cover illustrations for The Saturday Evening Post. During his career, Rockwell created so many memorable illustrations for calendars, covers for the Boy Scouts of America (BSA) publication, the Boys’ Life and various series, such as the “Willie Gillis” and the “Four Freedoms” series. Other memorable works include “Saying Grace,” “The Problem We All Live With” and “Rosie the Riveter.” Rockwell, who had a 64-year association with the Boy Scouts of America, created many illustrations such as “A Guiding Hand,” “A Scout is Reverent” and “The Scoutmaster” that reflected the Scout Law and the Scout Oath. At age 14 Norman Rockwell enrolled at the Chase Art School after high school before he moved to the National Academy of Design until he enrolled at the Art Students League where he was taught by Frank Vincent DuMond, George Bridgman and Thomas Fogarty. As a young illustrator, his early works were used for the St. Nicholas magazine and the Boys’ Life publication of BSA and other youth-oriented publications. Because he was still a student at that time, his works were concentrated on small and less important projects. At the age of 18 he received his first major project, illustrating for the Tell Me Why: Stories about Mother Nature, a book written by Carl H. Claudy. When his family moved to New Rochelle, Rockwell shared a studio with Clyde Forsythe, a cartoonist for The Saturday Evening Post, who helped him to submit his first painting for a cover of the magazine. It was called “Mother’s Day Off” and was published on May 20, 1916. It was followed by several more, such as “Circus Barker and Strongman” that was published on June 3, “Gramps at the Plate” on August 5, “Redhead Loves Hatty Perkins” on September 16, “People in a Theater Balcony” on October 14 and “Man Playing Santa” on December 9. His stint with The Saturday Evening Post was quite fruitful, and Rockwell published 323 original covers covering a period of 47 years. Most of his illustrations are slice of life scenarios, much like the celebration of rural life as popularized by Julien Dupré in the 19th century. Norman Rockwell’s career as a cover illustrator did not end with The Saturday Evening Post. He also successfully created covers for other magazines, including Life Magazine, Peoples Popular Monthly, Judge, Leslie’s Weekly, The Country Gentleman and The Literary Digest. 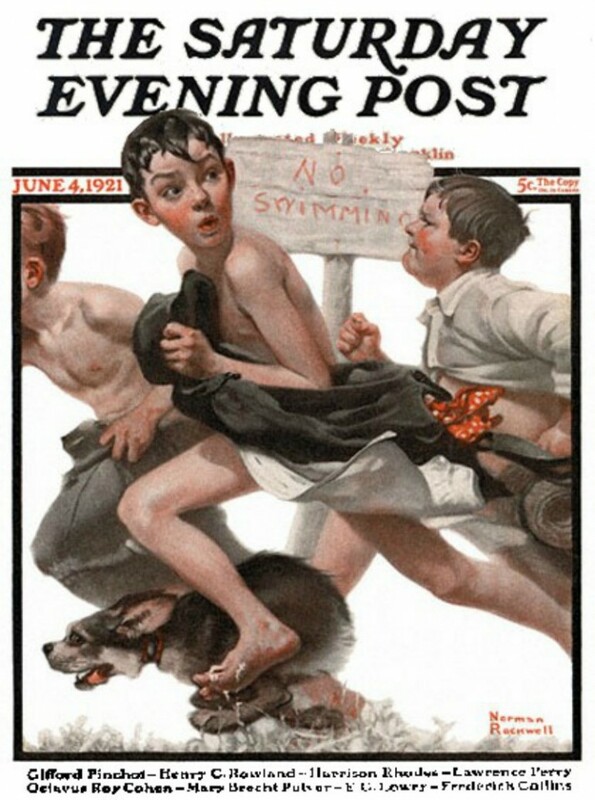 When he started working at The Saturday Evening Post, Rockwell left his position at Boys’ Life although he continued to include them in the covers he created for the magazine and in the monthly publication of the American Red Cross. It 1926 he again worked for the BSA, creating 51 original illustrations for the annual calendar of the Boy Scouts of America. Although he successfully enlisted in the U.S. Navy during the First World War, he never saw any action because he was assigned as a military artist. He painted his very popular series, the “Four Freedoms” in 1943, working on it for seven months during the war. He drew inspiration for the paintings from the speech given by Franklin D. Roosevelt, wherein the president described the universal rights’ principles: Freedom from Fear, Freedom of Worship, Freedom of Speech and Freedom from Want. All four paintings were published by The Saturday Evening Post in 1943. His last painting published in the Post magazine was in 1963. Rockwell then worked for Look magazine for 10 years. He also painted portraits of several celebrities such as Judy Garland and political figures like Jawaharlal Nehru and Gamal Abdel Nasser as well as portraits of U.S. Presidents Eisenhower, Kennedy, Johnson, and Nixon. At age 82 he did his final commission for the BSA: “The Spirit of ’76” that was used for the Boy Scouts’ calendar. In 1977 Norman Rockwell was awarded the highest civilian honor, the Presidential Medal of Freedom. He also received the Silver Buffalo Award in 1939. It was the highest adult award given by the BSA. His calendar illustrations for the Boy Scouts were almost as popular as the “Four Seasons” illustrations he did for Brown & Bigelow. During his entire career, he was able to produce more than 4,000 original paintings and illustrations. He also illustrated more than 40 books including Huckleberry Finn and Tom Sawyer. He created six paintings for Coca-Cola that were used for their advertising campaigns and hundreds of illustrations used in posters, stamps, catalogs, murals, booklets, playing cards and even sheet music.